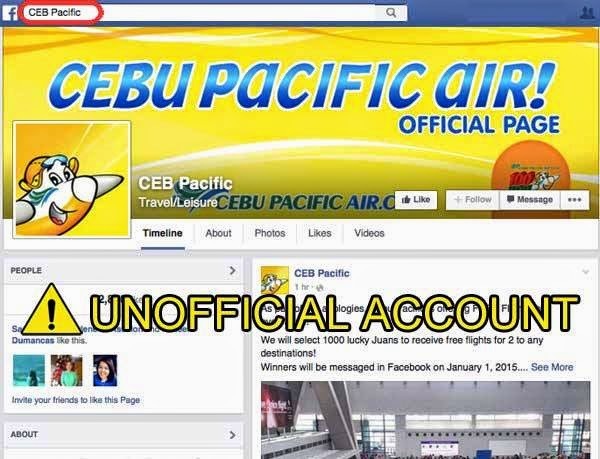 Aviation Updates Philippines - The Philippines' largest low-cost carrier, Cebu Pacific Air, warns the public against its spreading fake accounts on the social media. The carrier said that passengers should only book from its OFFICIAL website, hotlines, or ticketing offices. "We will coordinate with authorities to identify parties behind this page, so we can take necessary legal action," an official of Cebu Pacific said on its official Facebook page. Last month, Cebu Pacific submitted to the Philippine National Police and to Facebook the deactivation of the said page and establish the details such as the names, internet protocol addresses, and transactions details of supposed fraudsters. "We have also already reported this page to Facebook, and will continue reminding everyone to be vigilant. Keep alerting us about accounts posing as CEB! Let's keep Facebook safe for us all," the carrier added. One of the fake accounts, which is named as CEB Pacific, gave free seats on Facebook for 1,000 lucky passengers as part of its apologies to the affected passengers during the incident on Christmas day. The lucky passengers will be notified on January 1, 2015, the fraud account posted. Last month, the carrier turned over 14 Facebook profiles which turned out to be a fraud. "These profiles have been reported by some of CEB's Facebook fans," Cebu Pacific Air Vice President for Corporate Affairs, Jorenz Tañada said last month.